What is it? A patch box! This week’s mystery object is a patch box! 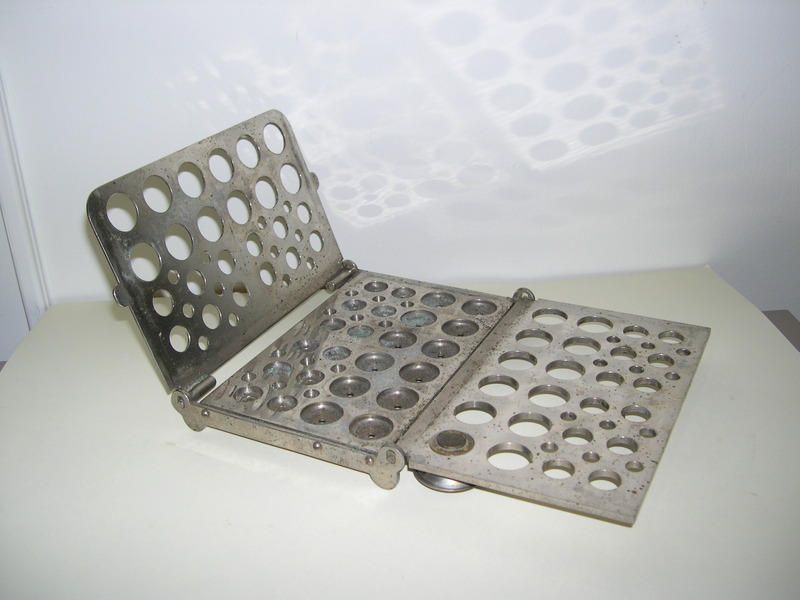 Patch boxes were used to store patches (false beauty marks) which were fashionable in the 17th and 18th centuries. The patches consisted of bits of gummed taffeta or other fabric used to emphasize the beauty or whiteness of the skin or to draw attention to a particular facial feature, such as a dimple. They were also used to hide flaws such as scars, pimples, etc. They varied in form and design from simple spots, stars, or crescents and were sometimes dyed brilliant colors. The interior of the lid was usually lined with a mirror and sometimes held two compartments, one for the patches and the other for rouge. In its heyday (1700s), both men and woman used patches, although it appears to have been more common among women. 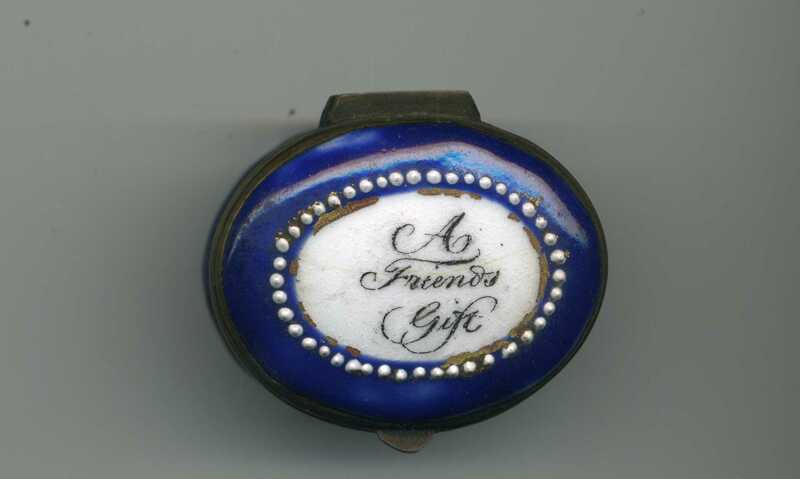 Patch boxes were commonly given as gifts and the covers are often decorated with declarations of friendship. What is it? It’s a foot warmer! 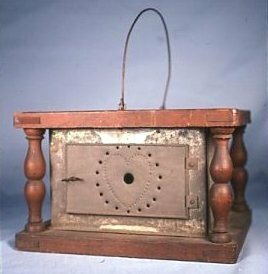 This week’s mystery object is a foot warmer, also called a foot stove. They were placed under a woman’s skirts or under lap robes or a blanket. They were a welcomed source of heat on a cold carriage ride, during a religious service, or even at home. There is some debate as to how these were heated. Most researchers believe that hot coals or embers were placed inside the smaller inner box. The punched holes allow the heat to escape and oxygen to enter the warmer to keep the coals alive. Some people, however, think that the punched designs are simply decorative and the warmer was heated with hot stones. 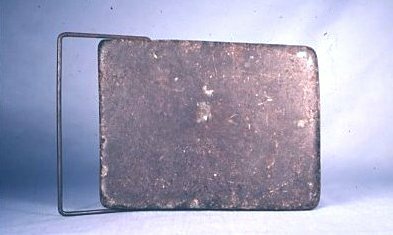 Some warmers actually do contain slabs of soapstone; some of these stones even have wire wrapped around them to serve as handles. But does that mean that only stones were used? What about the inner tin pans? What is it? A coin purse! 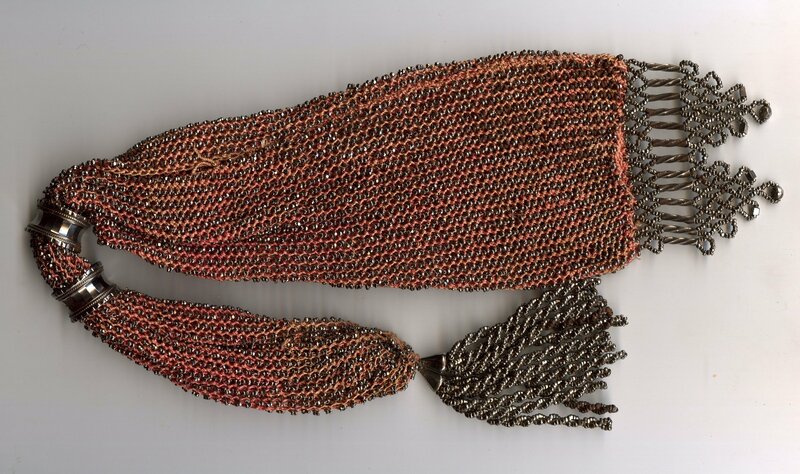 This week’s mystery object is often referred to as a miser’s purse. The slit in the center allowed for coinage to be easily placed inside; the sliding rings secured the coinage into two different groups. This could be used to segregate coins of a lesser value from those of greater value or to separate money belonging to different individuals. Notice that each end of the purse is decorated with a different fringe. The reason for this asymmetrical design is to help the user retrieve the coin from the proper side. What is it? It’s a swift! 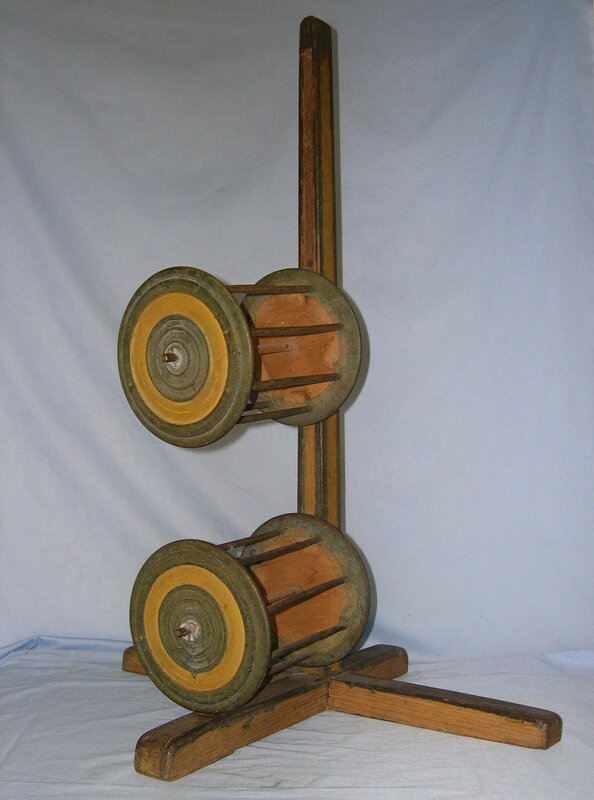 This week’s mystery object, also known as a squirrel cage swift, was used to wind and unwind skeins of yarn smoothly. The long slot allows for multiple positions of the cages and accommodate various skein sizes. This is a great tool for changing skeins into balls, bobbins, cones or spools. It dates from the mid 19th century. What is it? It’s a pill machine! This week’s mystery object was made by J.M. Grosvenor & Company of Boston, MA. 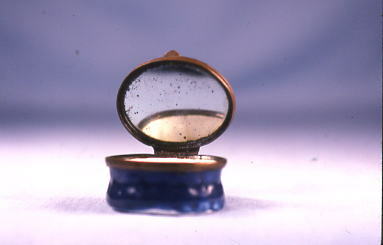 This particular device was patented by 1885. Saucer shaped rice-flour disks known as “Konseals” were pressed into the perforations on the cover and base plates, while the shield plate was folded back over to protect the sealing edges of the Konseals in the base plate. 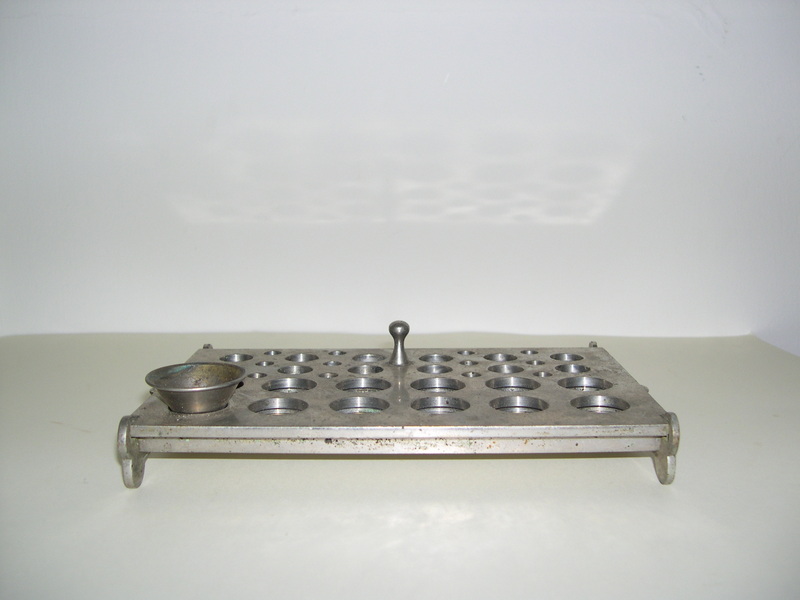 The Konseals in the base plate were filled with powdered drugs with the help of special funnels and tamped down with thimble compressors (missing in this example). The shield plate was lifted, and a moistened roller passed over the edges of the empty Konseals in the cover plate, which was covered over the base plate, sealing the Konseals. The Konseals were made of thinner material than ordinary cachets so the finished product was less bulky and neater in appearance. What is it? Nine Men’s Morris game board! 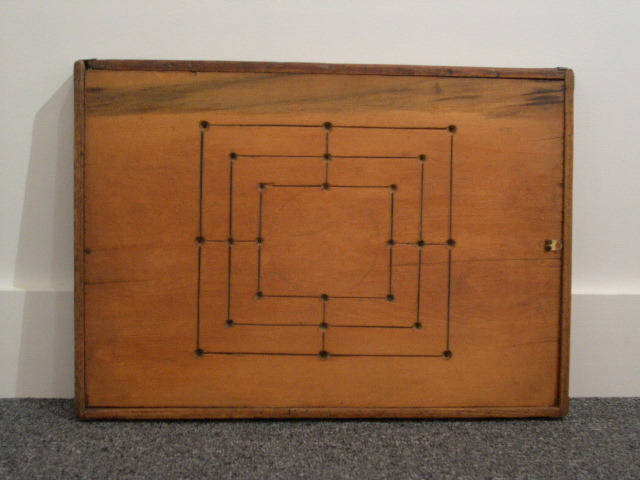 This week’s mystery object is a Nine Men’s Morris game board, a cool cross between checkers and tic-tac-toe. The board consists of a grid with twenty-four intersections. Each player has nine pieces or “men”. A player tries to line up three of his own men horizontally or vertically; when this is successfully done the player can remove one of his opponent’s men from the board. A player wins by reducing his opponent to two pieces or by leaving him unable to move. Nine Men’s Morris has been played for over 2,000 years. This particular board dates from the 1700s. What is it? A dough trough! The dough trough allowed ample room for kneading lots of dough on the top surface as well as space for rising in the interior. It is also known as a “dough box”, although according to Merriam-Webster this term was first used around 1944. Because families tended to be much larger than today and bread was consumed at every meal, baking bread was a major task. 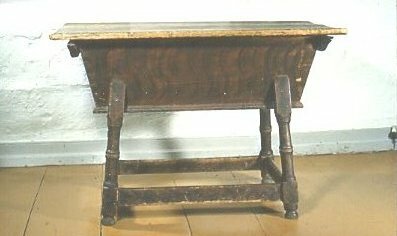 A dough trough helped with the production of perhaps a dozen loaves at a time, depending on the size and needs of the family.